Many specialists and consumers relentlessly debate about what time to floss. The theory behind flossing before brushing the teeth is one of strategy. 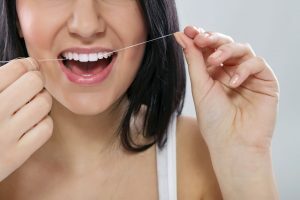 By flossing first, the patient is removing debris from between the teeth and shifting into the mouth so that the person can remove it with a toothbrush. A person should floss after all main meals no matter how many meals he or she eats. It keeps the person from growing decay-causing bacteria in between the teeth. A patient should choose thick dental floss instead of thin floss because its quality is much better. The consumer can truly reach in between the teeth and pull out a large object without having issues. Spearmint and peppermint are two products that can work wonders for the mouth. They can prevent foul breath, and they can provide a person with a strengthened immunity to deterioration. Dental floss is not always the easiest product to use. That is why consumers have to try several items and decide what is best for them. Dental floss picks are helpful because they allow the user to maneuver and really get in between the teeth without too much hassle. Finally, a dental patient should always contact the dentist and keep up with regular oral care appointments. Twice per year is the recommended number of times a patient should visit. Dana R. Walters DDS. is a specialist who proudly provides some of the most reliable services in the locale. A patient or prospect can set a date by calling 614-721-1975 and scheduling an appointment. Why Is It Important to Receive Annual Dental X-Rays?